Blindfolding blind people sounds like an oxymoronic exercise. But it is clear that some people with no visual light perception, do, in fact, entrain normally. I believe it was Charles A. Czeisler who, about 1980, discovered that some blind people entrain normally to the 24-hour light/dark cycle while others do not. He and colleagues worked with a number of blind people throughout the 1990s, reporting the results in such papers as this one from 1995 and this one from 1998. These researchers, as well as others, worked on determining the circadian periods of individuals by the use of forced desynchrony, so-called constant routines. Conditions which are impossible to entrain to, allow mapping of body temperatures and melatonin levels. The illustration above, from the 1995 paper, shows two days and nights in the lives of a sighted (above) and a blind (below) *person. They call this the “Melatonin Suppression Test”. Circadian phase is determined in the first night: the high point of the level of melatonin in the blood corresponding more-or-less to the low point of the core body temperature. 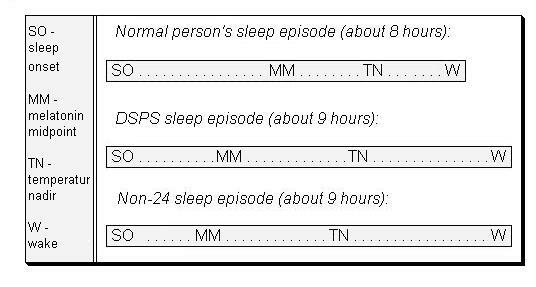 The second night both subjects are submitted to 90 minutes of bright light (the white columns) at the time of their highest melatonin levels the night before. And the melatonin levels go way down in both subjects! In a repeat of the test with the blind person blindfolded, the light had no effect. Obviously, somehow, the light signal makes it to the body clock in some blind people. More about how this works, for all of us, in the next post.